It’s been two years since I made some of these pig troughs out of an empty 55 gallon barrel and I’ve made one important change to the “design” that improves it quite a bit. What is this big change? 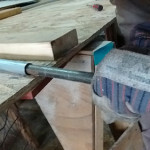 Deleting the wooden “leg” on one end. This .33 pig trough (one third of a barrel) is pretty much indestructible even in the presence of large, motivated and ornery pigs. The problem is that the pigs can easily move them around, as they can do with most anything that weighs less than 1000lbs. So when the pigs inevitably move them to the other side of the paddock, it’s much easier for the human (me) to drag them back to their rightful place when there’s only one big heavy “leg” to contend with. Just pick up the light-weight end and drag it. Andrew, I’m guessing the pigs made the “improvement” and you were sensible enough to recognize it! 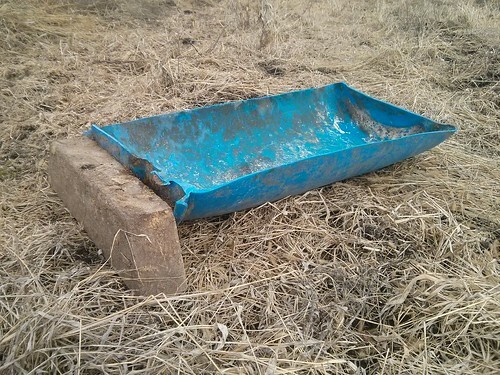 I “improved” the first trough by running out of spare bits of 4×4 to use, the pigs “improved” one of the first troughs through a good few years of daily use.